I’m fascinated that there are so many different takes on the fantasy of meeting your doppelganger. Jose Saramago wrote a book in which the protagonist feels he must kill the doppelganger. I wrote an unpublished novel in which the main character is seduced by his doppelganger into morally questionable actions. José Augustín has an entirely different, highly entertaining and original approach. Here’s a summary lifted from Amazon: Life with my Widow is a game of mirrors where reality loses its contours as it comes in touch with the intangible and the non-existent comes to life in its very deathbed-a thriller as provocative and funny as it is disturbing and enigmatic. The main character, the husband of an indigenous Oaxaca shamaness, watches an identical man die. As the unknown man draws his last breath, the protagonist of this insightful narrative decides to switch identities. He wants to know what his wife and children will do once he is dead. What he fails to foresee is that he will also inherit the terrible commitments of the man whose identity he has adopted. 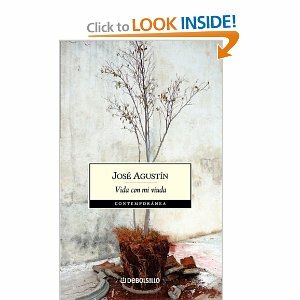 Winner of the 2005 Mazatlán Literature Prize, Life with my Widow confirms José Agustín as one of the greatest, most original and insightful voices in contemporary Mexican literature, an author in full command of his art. EN ESTE CUENTO DE BRUJAS UN CINEASTA EXITOSO Y EROTÓMANO,CASADO FELIZMENTE CON LA HERMOSA NIETA DE UNA CHAMANA INDÍGENA DE OAXACA,VE MORIR EN SUS BRAZOS A UN HOMBRE IDÉNTICO A ÉL Y DECIDE IMPULSIVAMENTE INTERCAMBIAR IDENTIDADES.OFICIALMENTE MUERTO,DESEA SABER QUÉ HARÁN SU ESPOSA Y SUS HIJOS. add The Scapegoat by Daphne du Maurier to your doppelganger lit pile – I loved the Saramago.